The recommended doses of fenugreek differ depending on the purpose of supplementation. Importantly, the studies have shown that even large doses with long-term use are safe for the body. The supplement contains a highly standardized extract, therefore, according to the manufacturer's recommendation, 1, maximum 2 capsules per day should be taken. 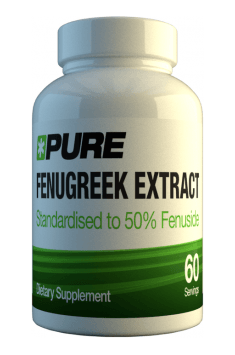 Fenugreek can inhibit the absorption of orally-taken-drugs, therefore, when using any pharmacological agents, a minimum 2 hours should be allowed between the dose of the drug and the supplement. Due to its ability to thin the blood, fenugreek may interact with popular anticoagulants (aspirin, warfarin) and prolong the blood clotting time. Fenugreek promotes lowering of blood sugar levels, so people taking antidiabetic drugs must be cautious and systematically monitor serum glucose to prevent hypoglycemia.